Hi Everyone! I hope you are ready to do some crafting! 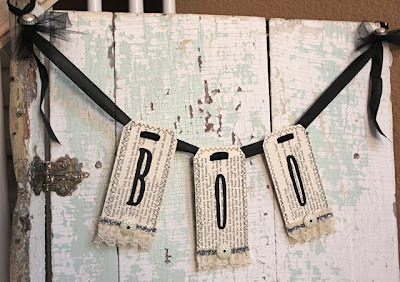 Today I'm going to teach you how to make an easy Boo Banner for Halloween. I hope you enjoy it! Tip: I encourage you to use items you have on hand. Your banner does not have to look exactly like mine. 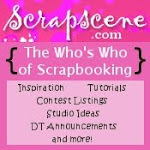 Go through your scrapbooking supplies, your sewing supplies, even your junk drawers and make use of what you have! 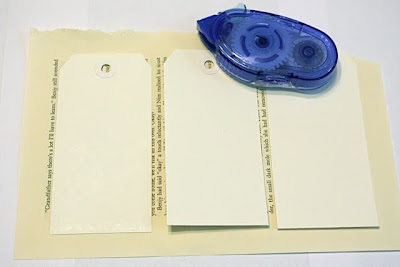 Step 1: Glue your 3 tags onto your book page paper. If you are going to sew around the edges then just put adhesive in the center of the tag. 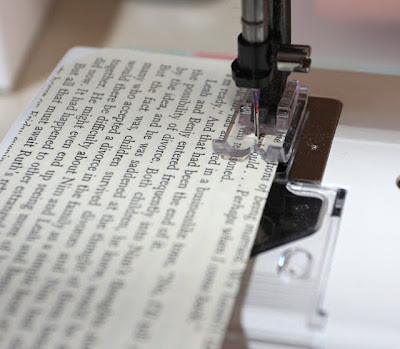 You don't want to gum up your sewing machine with glue. If you are going to draw your stitches on the tag, then go ahead and glue all the way around your tag so it is adhered well. 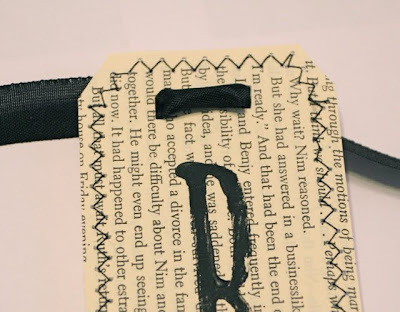 Step 2: Cut around out the tags using the edge of your tag as a guide. Step 3: Sew a decorative stitch around all edges of all 3 tags. I used the zig zag stitch. If you don't have a sewing machine you could hand stitch around the tags. Step 3: (Optional Non Sew) If you don't want to sew at all then you can use a black pen to draw stitch marks around your tags. 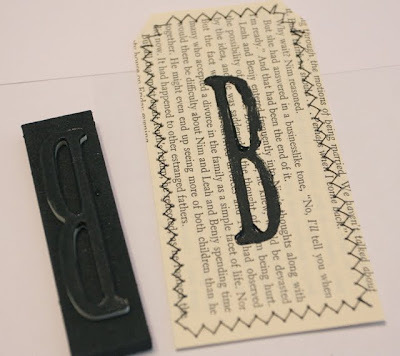 Step 4: Stamp your letters on all 3 tags. I used foam stamps with black paint. However, you can use any stamp with paint or ink. You could also use stencils or chipboard letters. Let your letters dry before the next step. 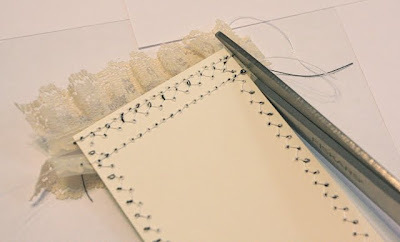 Step 5: Cut 2 lengths of lace and 1 length of chenille stem for each tag. The length should be a little longer than your tag. You can trim it up later. 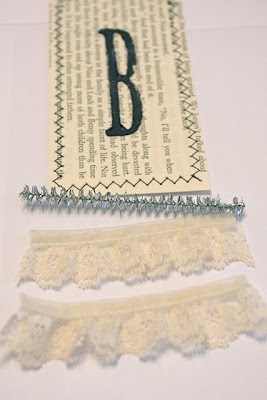 Step 6: Sew the first piece of lace to the bottom of your tags. 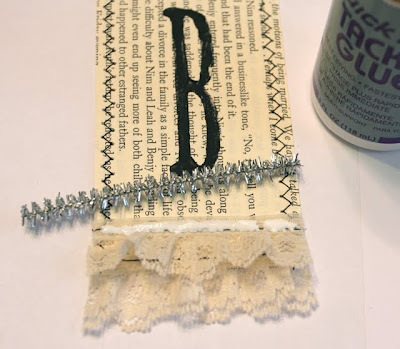 If you do not want to sew then just glue your lace down with clear drying glue. Step 7: Sew the second piece of lace above the first piece and overlap onto the first piece just a bit. 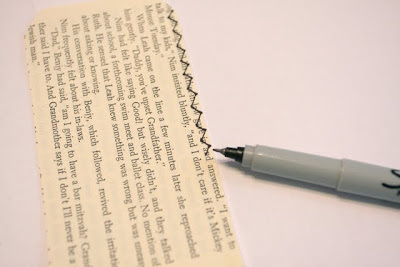 Again you can glue this if you don't want to sew. 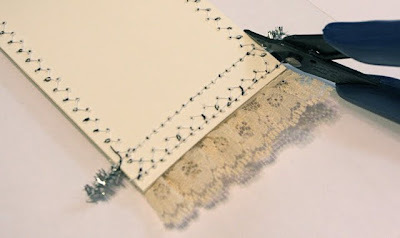 Step 8: Trim the excess lace from each side of the tags. Tip: turn your tag over and use the edge of the tag as a trim guide. Step 9: Glue the chenille stem piece at the top of the second piece of lace. Let dry. 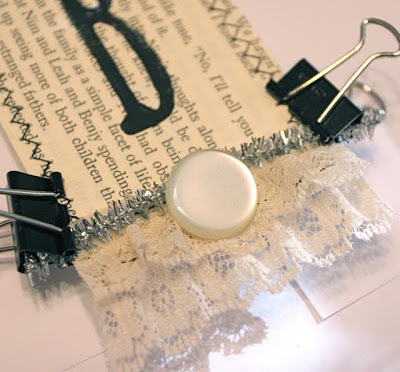 Tip: I like to "clamp" my pieces with binder clips or clothes pins until dry. Step 10: Glue or sew on the cream colored button to the bottom of each tag. Let dry if you are gluing. Step 11: Trim the excess chenille stem off using the back of your tag as a trim guide. Tip: Use a pair of wire cutters or junk scissors to trim chenille stems. The wire inside the chenille stems can make nicks on the blade of your good scissors. 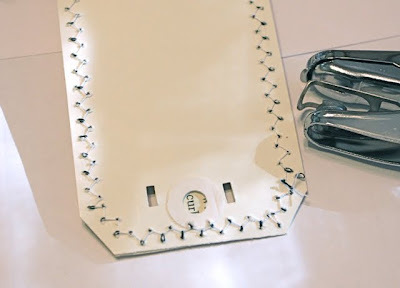 Step 12: Turn the tags over and punch holes on each side of the original tag hole. These holes will be what you thread your hanging ribbon through. 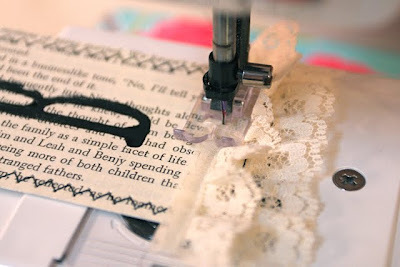 If you don't have a hole punch you could use an exacto knife or just carefully punch holes with your scissors. 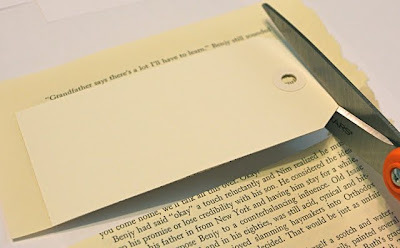 Step 13: Thread the desired length of seam binding or ribbon through your tags and space tags out evenly, about an inch apart. Step 14: Tie a loop in each end of the seam binding for hanging. 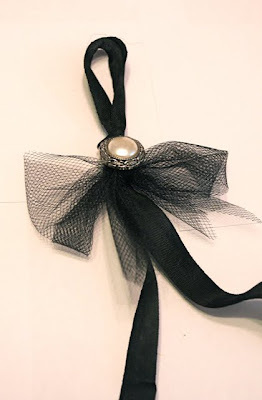 Step 15: Sew or glue a decorative button or embellishment onto the knot on each loop. 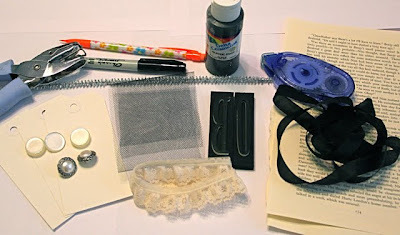 Step 16: Tie a piece of tulle or ribbon under each loop. Step 17: Hang up your cute little Boo Banner for all to enjoy. Tip: This process can be used for any holiday banner. Spell out anything you wish! Use any color you wish! You could make cute name banners for your child's bedroom. Banners for birthdays would be great and can be used over and over again. Or banners with your favorite inspirational word would look great hanging in your home! 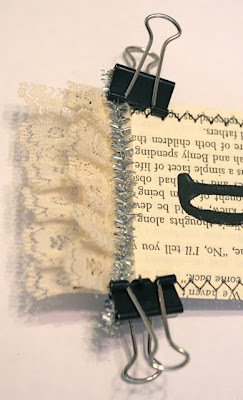 It's a great quick craft project that uses up extra supplies and scraps that you may not have otherwise used. I hope you have enjoyed this easy tutorial! 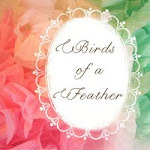 I encourage you to think out of the box and create some wonderful banners! 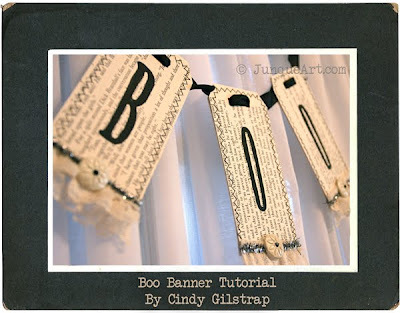 Please be sure and show us your Boo Banners or variations of the Boo Banner tutorial in the Joli Flickr Group! Also please be sure and mention the tutorial came from Joli Paquet. Another great tut Cindy! I love this & will make it one night this week when I do my Boo Girl kit...hope you're feeling better! Thank you so much for an easy to follow tutorial! Can't wait to make one and can use supplies I have on hand. So cute! I will try to make one. Thanks for sharing it. this is absolutely darling! 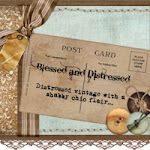 I love the idea of using tags for the sign....so cute! Too cute! Great directions and creative suggestions for using what we have! Awesome! This is so pretty! I love the lace. Thanks for the directions, I'll be linking. Great idea, thanks for the inspiration, can't wait to try it! I love this and it can so easily apply to other ideas. Thank you! LOVE IT! 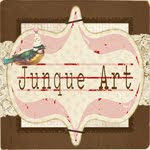 Inspired....going up to my studio and going to start creating.....I am thinking Christmas! Thanks for the inspiration!!! Adorable! :D I love Halloween in just cream and black! Thanks for a great tut! Now that's a hot tutorial! Thanks for sharing! 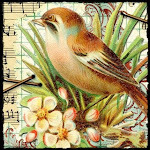 Please stop by and read my post at TesoroFino.blogspot.com about my dad's Fresco Paintings in the Cathedrals of Southern Italy. The photos are lovely and no matter what age I am, I'm still daddy's proud little girl. Come see; you'll be glad u did!